(Reuters) – A Missouri appeals court on Friday threw out a $55 million verdict against Johnson & Johnson in a lawsuit by a woman who claimed she developed ovarian cancer after using talc-based products, including J&J’s baby powder, citing a U.S. Supreme court ruling on where such cases can be brought. When Dr. Mark McClellan sat for an in-depth 30-minute question-and-answer session at an April health policy forum, the audience was filled with top researchers, advocates and Capitol Hill staffers eager to hear what insight the former head of the Food and Drug Administration would dispense. (Reuters) – Iowa’s Supreme Court on Friday rejected a 72-hour waiting period for abortions signed into law last year, ruling it unconstitutional. THURSDAY, June 28, 2018 (HealthDay News) — Robots work on assembly lines and assist doctors in the operating room. They manage inventory in warehouses and vacuum floors in homes. And one day soon, they could help care for Alzheimer’s patients. 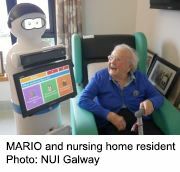 Several teams of scientists from around the world are investigating ways in which robots might help manage the daily living tasks of people with Alzheimer’s disease. The goal is to better identify which patients can tolerate intensive chemotherapy, and which patients may need modified treatment regimens because of underlying conditions, such as cognitive impairment, that often go undetected by oncologists. Fewer than 25 percent of older cancer patients currently get these assessments, which evaluate a person’s functioning (what he can and cannot do), psychological status, nutrition, cognition, social circumstances and other, coexisting medical conditions, and which can predict the potential toxicity of chemotherapy. (Reuters) – Amazon.com Inc said on Thursday it would buy small online pharmacy PillPack, a move that will put the world’s biggest online retailer in direct competition with drugstore chains, drug distributors and pharmacy benefit managers. The deal’s potential to disrupt major players across the drug supply chain nationwide prompted a sell-off in shares of possible rivals, while sending Amazon shares up 2.7 percent. HANGZHOU, China/SHANGHAI (Reuters) – In the eastern Chinese city of Hangzhou, an ambulance speeds through traffic on a wave of green lights, helped along by an artificial intelligence (AI) system and big data.